The already unique National Baseball Congress World Series upped its game in 2016 by inviting a team of former Major League Baseball stars headlined by seven-time Cy Young winner and 11-time All-Star Roger Clemens. The team joined a field of 30 teams of mostly college-age and amateur players from across the country to compete for a national championship. The amateur players relished the opportunity to play against big-leaguers while 55,000 fans flocked to the stadium to see the one-of-a-kind collection of all-stars. 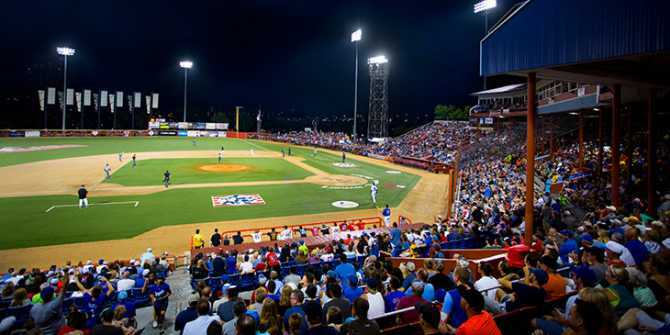 A team of former professionals again will be among the field during the 83rd annual National Baseball Congress World Series, referred to as the NBC, which runs from July 22 to Aug. 6 at Lawrence-Dumont Stadium in downtown Wichita. The players on the star-studded squad will be announced later this summer, however there are three dates when you’re guaranteed to see the Kansas Stars play (the team is sponsored by the Kansas Star Casino): Saturday, July 29; Monday, July 31; and Wednesday, Aug. 2. If the team advances in tournament play, they could potentially play Friday, Aug. 4 (quarterfinals); Saturday, Aug. 5 (semifinals); and Sunday, Aug. 6 (championship). Season and individual game tickets are on sale now. Organizers are expecting sell-out crowds for the Kansas Stars games. Here’s an overview of the NBC tournament, the premier showcase for college age amateur players for 83 years and the oldest continuous sporting event in Wichita. Tickets for the National Baseball Congress World Series are on sale now and can be purchased here. Season tickets are $100 (upper) and $150 (lower); individual session tickets are $9 and $13, respectively. There are also flex packs of 20 tickets that lower the per-ticket cost and can be used all at once for a group outing or any amount per day. Call 316-977-9400 to purchase flex tickets, season passes and group tickets. Watch social media for daily promotions, including upper section seats for $2 and family nights when fans receive a hot dog and drink with regular-priced admission. While the players for the 2017 Kansas Stars roster isn’t yet available, you’ll recognize many of the names. In 2016, the team featured almost a dozen MLB All-Stars: Clemens, Tim Hudson, Ben Sheets, Roy Oswald, Dan Uggla, Josh Beckett, Brad Penny, Jason Isringhausen, J.D. Drew, Jack Wilson and Brandon Inge. Watch for the roster announcement later this summer, and there will likely be an autograph session during the tournament, too. Thirty teams will be playing for the coveted national championship. The World Series will have 16 teams competing during the first week in pool play, with the top two teams qualifying for Championship Week. The format calls for four teams in four different pools with the top team from each pool advancing to a single-elimination game. Those two winners advance to Championship Week. Championship Week will have the same structure: four teams in four pools. However, the top two teams from each pool will advance to elimination games on Friday, Aug. 4. Semifinals will be held Saturday, Aug. 5, with the two remaining winners facing each other on Sunday, Aug. 6. Clemens and many of his 2016 Kansas Stars teammates were NBC alums. More than 800 NBC World Series players have gone on to play Major League Baseball. That’s an average of 10 players each summer who come through Lawrence-Dumont Stadium and eventually play on baseball’s biggest stage. In 1934, sporting goods salesman Raymond “Hap” Dumont convinced the City of Wichita to build a new stadium in order to host a national baseball tournament. The first NBC tournament was a huge risk on his part, as similar tournaments had failed miserably on both coasts. Securing Satchel Paige – considered the greatest pitcher of the day – that first year helped make the tournament an instant success. Paige struck out 60 batters and won four games, garnering national media coverage for the tournament. Lawrence-Dumont Stadium is now named after Hap and Charles S. Lawrence, Wichita’s mayor when the stadium was built.